Growing peppers from seed can be a bit challenging for beginners, but it’s actually pretty easy once you get the hang of it. 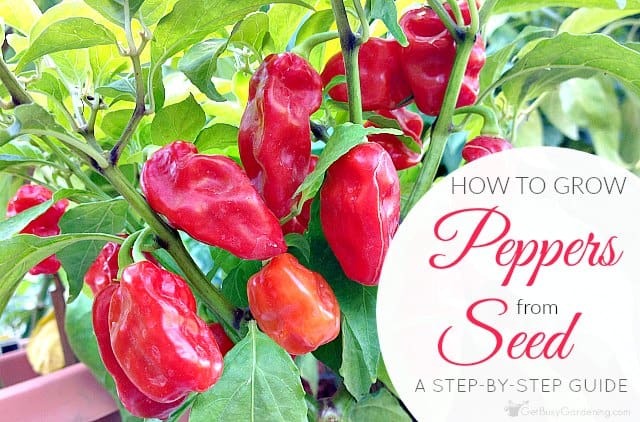 In this post, I am going to show you exactly how to grow peppers from seed step-by-step. 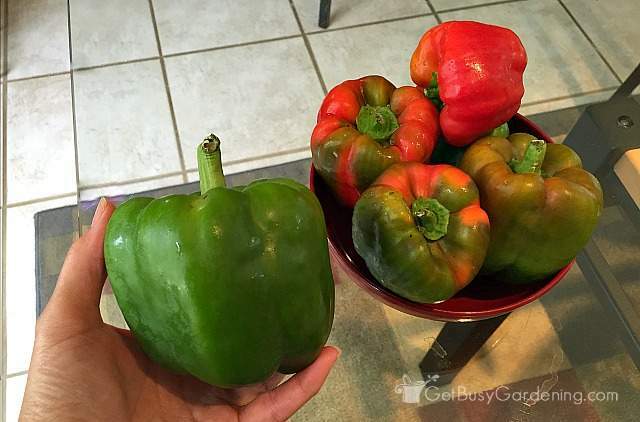 Peppers are one of my all-time favorite vegetables to grow in my garden! My husband loves them too, and we’ve grown tons of different varieties of sweet and hot pepper seeds over the years. One of the things that we love the most about growing peppers from seed is the amazing variety of peppers we can grow. Once you start shopping for pepper seeds, it’s pretty crazy to see how many different kinds there are to choose from. And the diversity is awesome too. Peppers range anywhere from the mild flavor of green peppers, to the sweetness of banana peppers, and the medium heat of chili peppers… all the way up to spicy cayenne peppers, jalapeños and the super HOT habanero and ghost peppers. Peppers like it hot! They will grow their best when planted in a full sun location after all chance of frost is gone, and the weather has warmed up in the spring. Peppers also grow really well in pots and containers, and would be perfect for patio or deck planters. Pepper plants don’t like wet feet, so make sure you plant them in fast draining soil and never allow the soil to get soggy. They grow best in fast draining, rich soil that has plenty of organic matter mixed in. Peppers also love to be fed throughout the growing season. To start them off right with plenty of nutrients, I like to mix an organic granular fertilizer into my soil before planting my pepper seedings. Here in Minnesota, our growing season is too short to plant pepper seeds directly in the garden. In climates that have shorter winters, some people start pepper seeds using the winter sowing method. But in cold climates like mine, the best way to get a good crop of peppers is by planting pepper seeds indoors 8-12 weeks before the average last frost date (our average last frost date in Minneapolis is May 15th). One quick note before starting… if you’re planning to start jalapeños from seed (or any other hot pepper), I recommend wearing gloves. I wear contact lenses and have had a few bad experiences taking out my contacts after handling any part of a hot pepper, including the seeds. Peppers take a long time to produce mature fruit, and they require a long growing season. Germinating pepper seeds can also be pretty slow to (some varieties take up to a month germinate!). 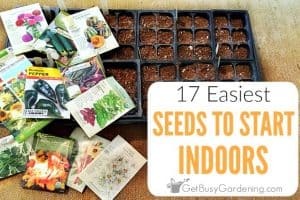 So for these reasons it’s best to start pepper seeds indoors using a high quality seed starting soil mix (or make your own DIY seed starting mix) or peat pellets. When I use seed starting trays or peat pellets to start my seeds, I plant one pepper seed per cell/pellet. 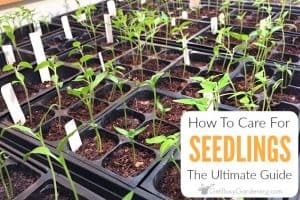 If I’m using old garden seeds that have a low viability rate, I will plant 2-3 seeds per cell/pellet, and then thin the seedlings out later. To plant pepper seeds, I like to lay the seeds on top of the soil, then gently push them down into the soil, and cover them with dirt. You could also make the holes first, then drop the pepper seeds in and cover. The rule of thumb for planting depth is to plant a seed twice as deep as it is wide. So plant your pepper seeds about a 1/4″ – 1/2″ deep. 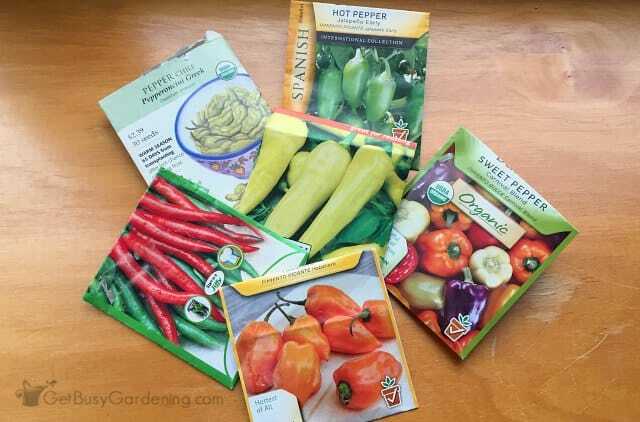 When it comes to growing peppers from seed, you need to be patient and keep in mind that some varieties will start to grow faster than others. Pepper germination is faster when the soil is kept warm. So to germinate pepper seeds faster, put your seedling trays on a seedling heat mat or over a heat vent if you can. It’s amazing how much faster pepper seeds will grow when you add bottom heat. Once your pepper seeds start to grow, you might wonder what to do next. Yikes! Well don’t worry, cause one of the best things about growing peppers from seed is that the seedlings are super easy to care for. 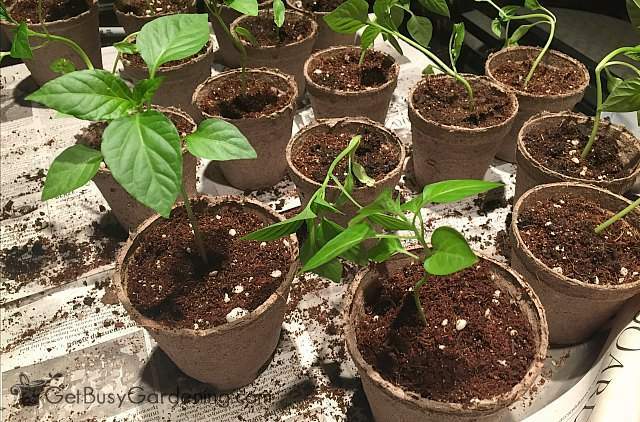 Like all seedlings grown indoors, they will require some care… but pepper plant seedlings aren’t super fussy. Watering pepper seedlings – Pepper seedlings don’t like soggy soil. 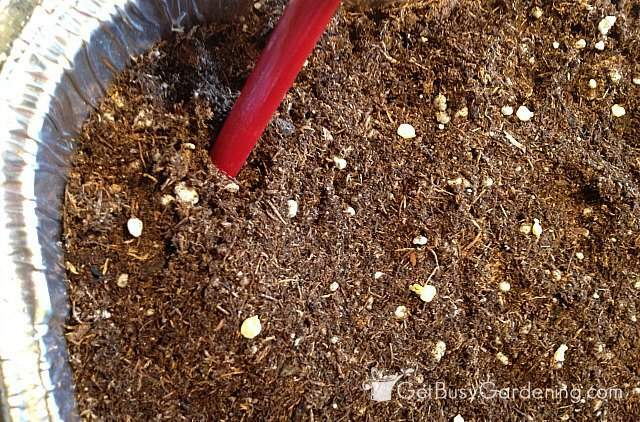 Allow the soil to dry out a bit between waterings, but never let it dry out completely. If you accidentally overwater your pepper seedlings and the soil is soggy, empty all the extra water that’s sitting in the seed tray. Then, turn an oscillating fan on low and position it to blow over your seedlings. The fan will help the soil dry out faster (but keep an eye on it, because sometimes this can dry the soil out too fast when a fan is blowing on the seed trays). 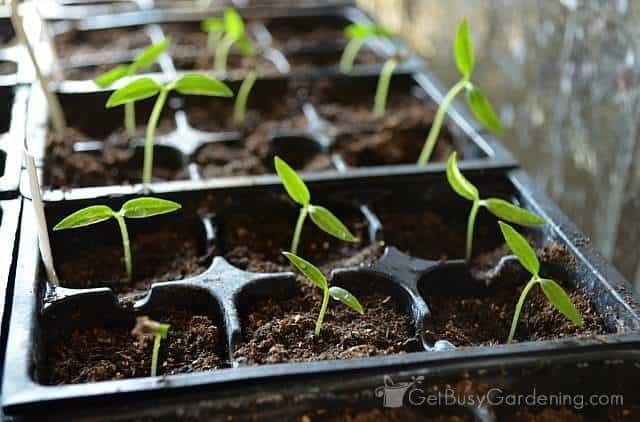 Pepper seedlings need lots of light – The nice thing about peppers is that the seedlings grow fairly slowly, so pepper seedlings don’t require as much light as other types of seedlings do. But if the seedlings don’t get enough light, they will start to grow leggy and reach for the light. So, in order to grow thick, compact pepper seedlings, it’s best to add a grow light. Hang a plant grow light a few inches above your seedlings once they start to grow, and keep it on for 14-16 hours per day. You can use an inexpensive fluorescent light fixture with plant grow light bulbs if you want to make your own seed starting grow lights. Also, get yourself an inexpensive outlet timer to give your seedlings the perfect amount of light every day. 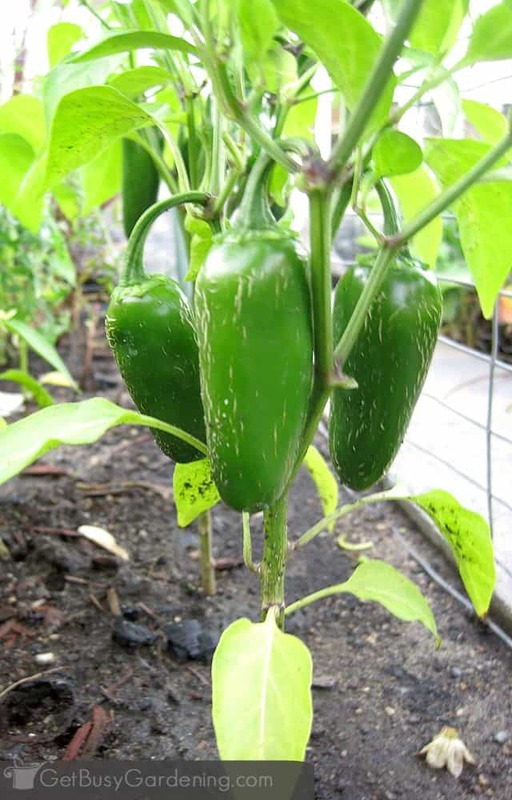 Best fertilizer for pepper plants – Once your pepper seedlings start to grow their true leaves (that is, any leaves that grow after the first two sprout leaves), it’s time to start fertilizing them, but you don’t want to feed seedlings a full dose of fertilizer right off the bat. It’s best to start with a weak dose at first, and slowly increase the strength of the fertilizer as your pepper seedlings grow larger. I recommend using a natural, organic fertilizer rather than chemicals. I use (and highly recommend) fish emulsion and an organic compost solution (or I make my own using compost tea bags) on all of my seedlings – they work better than chemical fertilizers and are much healthier for the environment, and for you. Pepper seedlings love it! 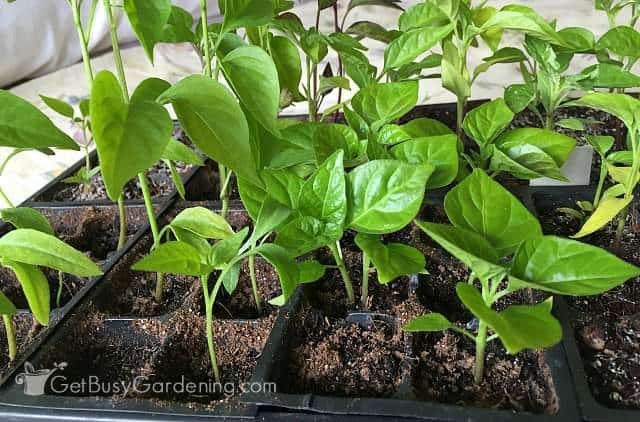 Potting up pepper plant seedlings – Once your pepper seedlings have started to outgrow the seed planting trays, it’s a good idea to pot them up into larger containers to give them plenty of room to grow. 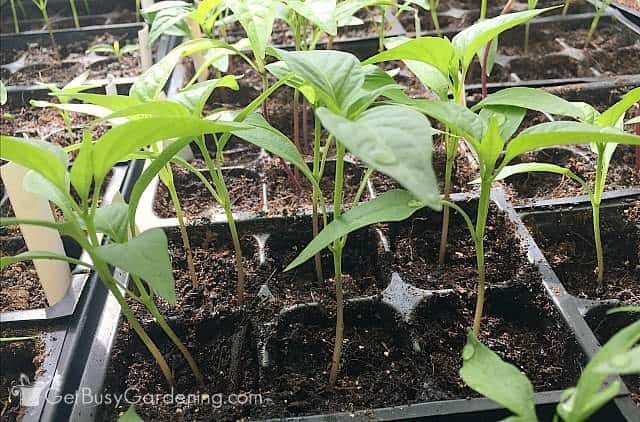 I like using plantable seedling pots to make it super easy to transplant my pepper seedlings into the garden. If you like the idea of using plantable pots, but prefer a more sustainable option over using peat, you could use coco coir pots, or cow pots. 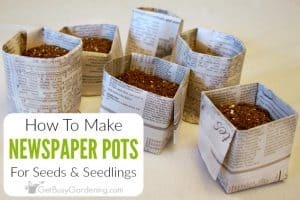 Otherwise, you can use small plastic nursery pots (which are reusable), or even recycled containers like yogurt cups or small milk cartons to pot up your seedlings. Once the weather start to warm up in the spring, we can get pretty antsy to get our pepper seedlings planted into the garden! 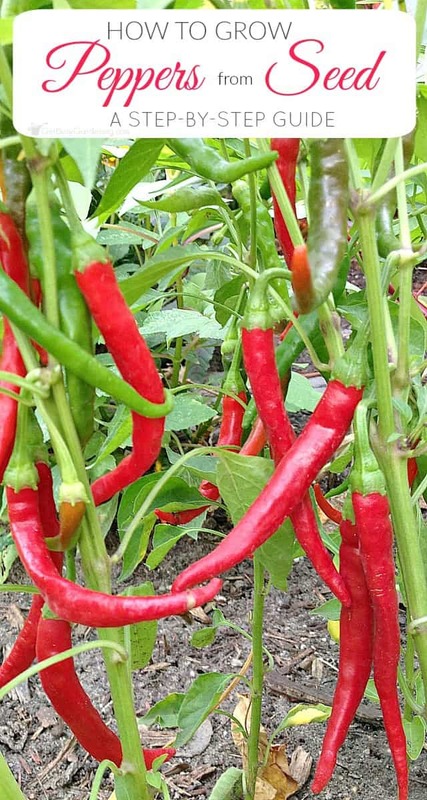 But pepper plants are not tolerant of cold weather, and the seedlings will suffer and their growth can be stunted if they’re planted into the garden too early. It’s best to wait to transplant your pepper seedlings until after all chance of frost is gone, and the soil has warmed up. But before you can think about planting them into the garden, they must be hardened off first to prepare them for life outdoors. Once the time finally comes to transplant your pepper seedlings into the garden, space your plants 12-18″ apart. 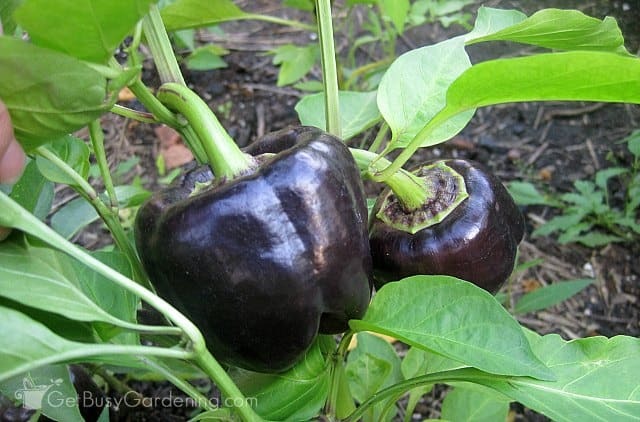 Pepper plants like to be touching each other a little bit once they get larger, so don’t plant them too far apart. Like tomatoes, pepper plants can get pretty heavy with fruit during the peak of the season and they might need extra support. You don’t need to use anything super heavy-duty for staking pepper plants. Wire tomato cages work great, or you can use short bamboo plant stakes or metal plant stakes. I recommend using a flexible stretch tie to tie your plants to the stakes so it won’t damage the plant as it grows. Once peppers start forming, pinch off new growth and some of the new flower buds to encourage pepper plants to put more energy into growing larger peppers rather than always producing new growth. Pinching also keeps pepper plants compact and bushy. Pepper plants like to be watered consistently, but don’t like wet feet. So give your plants a good, deep drink of water and allow the soil to dry out a bit between waterings. Feed your pepper plants a few times during the summer to keep them growing and producing their best. I like to top dress the soil with an organic granular fertilizer once or twice throughout the season. I also use liquid fertilizers a few times throughout the summer as well. Pepper plants love fish emulsion and liquid kelp, and they also love compost tea, which you can get in liquid form, or buy compost tea bags and brew your own. One of the great things about peppers is that you can harvest them even if they aren’t fully mature (which is what green peppers are – immature red, orange, yellow or purple bell peppers). So, you can harvest peppers once they reach a desired size, or leave them on the plant longer so they will become fully mature. The longer you leave peppers on the plant, the hotter/sweeter (and more colorful!) they will become. When harvesting, take care to cut the peppers from the plant rather than pulling them off to avoid damage to the plant. If you’ve never started seeds indoors before and have been wanting to try, I recommend starting with pepper seeds. Starting pepper seeds indoors is easy once you get the hang of it. Plus you’ll be rewarded with an abundance of peppers, which makes it well worth the effort. If you need a quick-start guide to growing seeds indoors, then my Seed Starting eBook is the perfect answer. 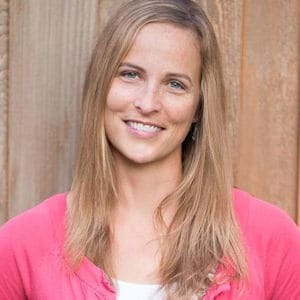 Otherwise, if you’re feeling overwhelmed by starting your garden from seed, or need someone to show you exactly how to do it all, then enroll in the Seed Starting Course. It’s a comprehensive online training with step-by-step videos and support to guide you along every step of the way! Share your tips for growing peppers from seed in the comments section below. "Here in Minnesota, our growing season is too short to sow pepper seeds directly in the ground." If you do direct sow, you will probably still get some peppers, but you'll leave a lot of flowers and small peppers on the plant when the first frost hits. Hi Michael, thanks for sharing your experience. Yes, all peppers are different. I've had cayenne peppers self sow for several years now and I actually get a pretty good harvest out of those few plants. But there are varieties that won't have enough time to mature before frost if sown directly in the garden. It's fun to experiment with extra seeds! I'm so glad to hear that peppers are easy to grow from seed. I actually started some sweet peppers this year for the first time and am excited to see them grow! Good luck with your peppers! You can also save the seeds in the fall to start next year. Have fun. I start many of my seeds in a counter top sprouter…..the kind you make salad sprouts in….it has 5 trays so I can start 5 different types. When the seeds sprout I just CAREFULLY plant then in dirt. One benefit of this is I don’t waste space on dud seeds. Awesome, thanks for sharing that tip! I love peppers, but I often have difficulty with the hardening off of my seedlings for all my veggies. Thanks for sharing your tips! 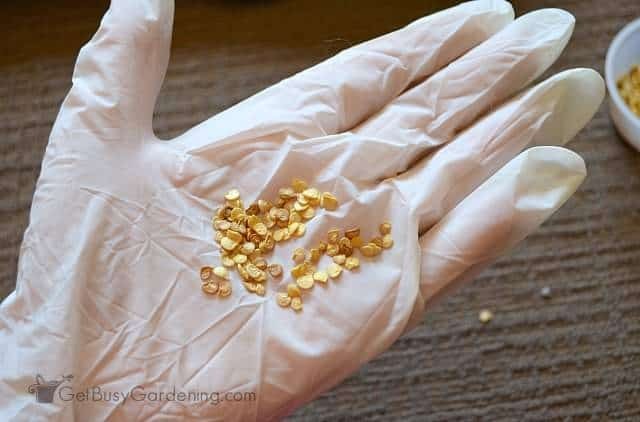 Great tips, and good to know about wearing gloves when handling the seeds. I am going to try growing peppers for the first time this year, and I’m glad to hear their not too hard. Awesome, I hope they will grow well for you! Glad I ran across your post. This is the first year that I bought pepper seeds, I usually buy plants. But I thought I would give it a try growing my own from seeds. Thanks so much for the tips, and the tip to wear gloves that never crossed my mind. You’re welcome, hope they will grow well for you. Trust me, if you forget to wear the gloves, and then later touch your eyes… you won’t forget again. LOL! I enjoy growing sweet peppers from seed and making Pepper Jelly. Great info. Yum, pepper jelly! That sounds awesome! I’ve never had much luck with growing peppers. Maybe with this advice I might get a crop – I definitely need to have another go at it! Yes, that are fairly easy to grow but do need a bit of special care. Hope they’re grow well for you this year! my pepper plant is acually diffrent kind. but im having a problem that.. it is not transfer flower into chilli.. the flower fall down by itself, by drying the flower. . what is the problm? I’m sorry, but I don’t understand. Are you saying that the flowers fall off of your pepper plant, and don’t get pollinated? Is that the problem you’re having? Nice detailed information. One piece of information that I am not able to find out from anywhere and would appreciate if someone can provide… when to take the Humidity Dome off of the tray. So here is what I do but not very successful. If someone can comment what step is wrong that will be really great. I am having trouble growing Bell Peppers, Hot peppers, Egg Plants. 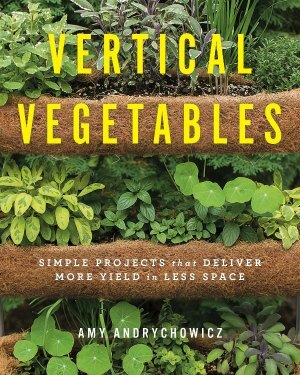 Tomato and other veg grow fine every year. I am in Hartford CT area. In the unfinished basement I set it up like this. then put 2 seeds a pot and cover very lightly without pressing much or at all. dome gets full of water in a day. in 4-7 days first seeds start sprout and only few come scattered. at that point I am not sure to keep the dome for remaining 75-80% seeds to sprout or remove dome to provide air and light to the ones that grew. And in that struggle mostly die off or are leggy. Now what I did today was opened the box from top, put a plywood plank on top and made a 8 inch whole in the middle of plank to put a light of full spectrum cfl bulb 100 watts. But kept dome still on. I do have a full spectrum light fixture 4 ft with two 32 watts T8 bulbs and transfer plants under it as soon as I can and have a fan too.Bot on timer 6 am to 9 pm. I don’t know if what I did this morning will work better. Any suggestions please. 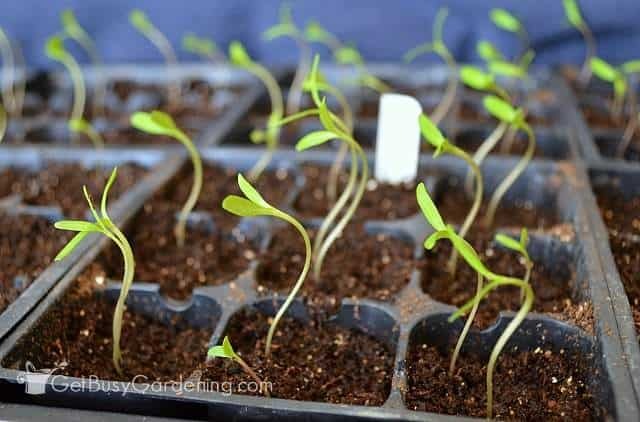 You should turn on your grow lights as soon as the first pepper seeds start to grow in the seed trays. 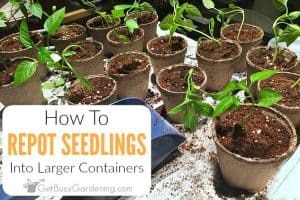 It’s ok to leave the lids on and the heat mat running until the other seeds sprout, but the seedlings need light as soon as they start growing or they will become leggy. If you’re only getting 75-80% germination rate, then I would test the viability of the seeds you’re using to see if the problem is old/infertile seeds. Here’s more information about general seedling care which will also help you care for your pepper seedlings. Good luck! hi! i have a couple pepper plants and one of them has a small pepper growning but it grows really slow, has been like 3 or 4 weeks and is still small and green, how long does it take to grow? should i cut some of the leaves? its winter but that plant its inside the house near a window for the sun. Since your pepper plant is growing indoors during the winter, it’s normal for it to grow much slower than when it’s outdoors during the summer. You could try giving it some organic fertilizer (like a liquid compost tea or an all purpose plant food) to give it a boost. Just make sure it’s getting plenty of light, or it could start to grow leggy. I am going to start an I door garden peppers for sure being in my garden! I have been saving seeds from the last couple times I have bought peppers from the store have you ever started your plants this way? How long do your seeds need to dry out? Yes, I have tried growing pepper seeds from grocery store peppers before, and it works just fine. I let the seeds dry out for a few days before planting them. Have fun!